Fraser Island is perched along the southern coast of Queensland, Australia and is about 200 km north of Brisbane and is within the Fraser Coast Region. Its length is 120 km and 24 km wide. It is a wonderful beach and is a heritage listed island in 1992. Fraser Island is also considered to be the largest island in Queensland and Australia’s sixth largest island as well as the largest island on the East Coast of Australia. This Heritage site is an ecologist dream having around 640 square miles of natural paradise which is untouched. One will find amazing remnants of tall rainforests with 1,000 years old trees growing on sand with half of the world’s fresh water dune lakes on the inland from the beach. The combination of shifting sand dunes, lakes and tropical rainforests has made it an exceptional site to explore. The island is filled with eucalyptus woodland, mangroves forests, rainforests, wallum and peat swamps together with sand dunes and coastal heaths which have originated due to the accumulation of around 750,000 years on volcanic bedrock which has provided a natural catchment for sediment carried by strong offshore current along the coast towards the northern area. The island is also a home to a small section of mammal species together with a diverse variety of birds, amphibians and reptiles and also includes the occasional saltwater crocodile. 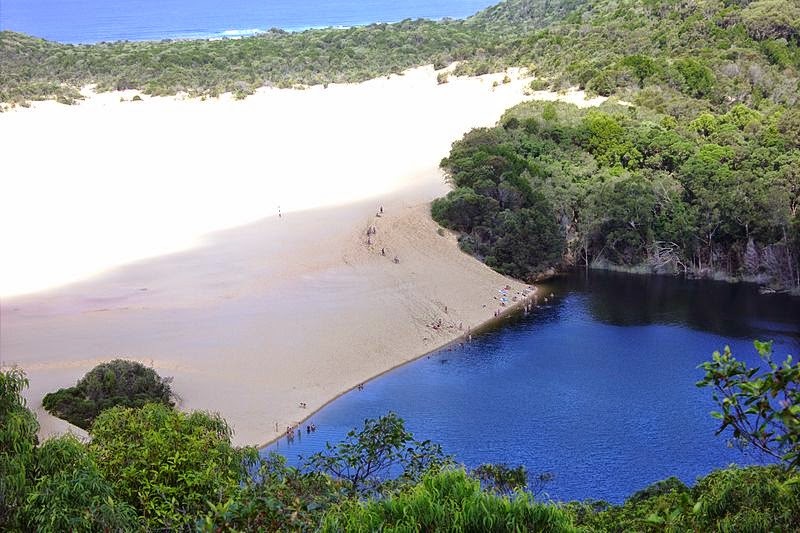 Being a part of the Fraser Coast Region, it is protected in the Great Sandy National Park. The island was inhabited by aboriginals for around 5,000 years. For a short period of time the island was known as Great Sandy Island and came to be known as Fraser due to the stories from a shipwreck survivor, Eliza Frazer. Fraser’s discovery has been credited to Captain Cook who had named many of the landmark features and its European name is the outcome of the shipwreck incident and the capture of the captain and his wife by local aborigines, the ordeal of which drew worldwide attention to the island, which was renamed in her honour and is now a popular tourist destination. This island is more than a unique location for visitors, being a home to aboriginal tribes who had used it like a paradise with its fauna and flora with endless bounty in fish and seafood, fruits, nuts together with an abundant supply of fresh water. As amazing as the coast, the waters which border the island coastline has been the site for over 50 shipwrecks, the most notable one being the Maheno, a former trans-Tasman luxury line as well as a World War 1 hospital ship. Till date, one will find the remains of the ship lying on the beach north of Happy Valley, which is also an added attraction for tourist, visiting the island. Being listed as a World Heritage site, the island also joins the ranks of the Great Barrier Reef, Kakadu National Parks and Uluru, as a unique environment.